« And Now For Something Completely Different: Bricks? To begin, I must apologize to my hosts the Tann’s. This post is eight months overdue. Although there have been some mitigating circumstances none individually or collectively can account for the delay. However, I think the timing may work out for the best, so that my readers can replicate my first visit to Captain Montague’s Bed and Breakfast. Before I begin, allow me to digress. In leading up to this post, I have written about some of the places I explored on Ohio’s north coast as part of the SKY Gourmand series (search the categories to the right). Combined with the CLE(veland) Gourmand Series, I think the north coast deserves a name change, so I am dubbing the Lake Erie Shores with a new name, the Food Coast. I build my case below. My lifetime in the Buckeye State had taught me to connote just a few activities with Lake Erie: Cedar Point, Put-In-Bay, Fishing and a long drive on 23 North. In my adult life, I have found better and more scenic routes to the north. I am allergic to fish, so that is a leisure time rule out for me. Cedar Point and Put-In-Bay as fun as they are for most people, make me cringe at the thought of throngs of hot, sweaty masses fighting me for personal space on a roller coaster or at the Round House Bar. I have learned a secret – The Food Coast is my culinary amuse bouche-ment park for eating. The fall is now my time for the lake and my time to feast. Using Captain Montague’s as the base of operations for Food Coast adventures – there is a lot to see, discover and of course, devour near the shores of our Great Lake. I will list a few below. I hope to write about a few more soon. Captain Montague’s is located in Huron, Ohio which as luck would have it is the heart of the Food Coast. See my list of exhibits below. Or in the Spirit of CLE Gourmand, heading east you can enjoy the following as an afternoon drive. Chef’s Garden just 10 minutes down the road. I think a great night would combine a Veggie U. Earth to Table Dinner with a night at Captain Montague’s and a long walk the next morning to work off the meal. Westside Market is one hour away, take cooler to stock up. So from a culinary viewpoint, Huron and the North Coast offer plenty of tastes, treats and temptations. I will also point out that mistress of the house of Montague, Judy Tann is no slouch in the kitchen. Feast your eyes on this breakfast below. Having, hopefully, sold readers on the merits of the area from a Gourmand’s point of view, let me digress again, to expound on the Bed and Breakfast experience. My previous Bed & Breakfast experiences were limited to Ireland and New Zealand. I did wonder if the B&B experience abroad translates to the shores of our country and in particular my state. Abroad, the B&B experiences offered a great value and kept me from feeling like a stranger in a strange land. As a non alien resident of Ohio, I wondered if a B&B would have anything to offer a fellow countryman. 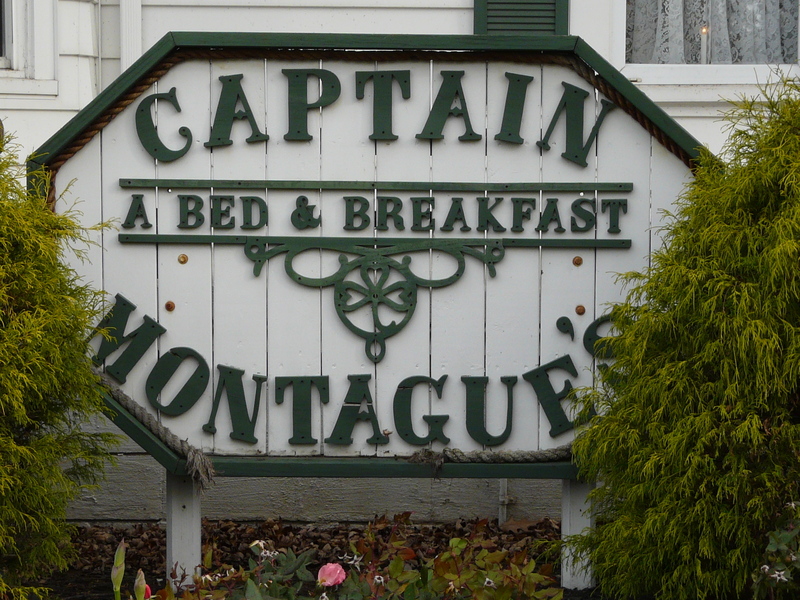 I am glad my first continental B&B experience was at Captain Montague’s. The Tann’s and the home have connection to the Emerald Isle, which I felt as the walked through the door. 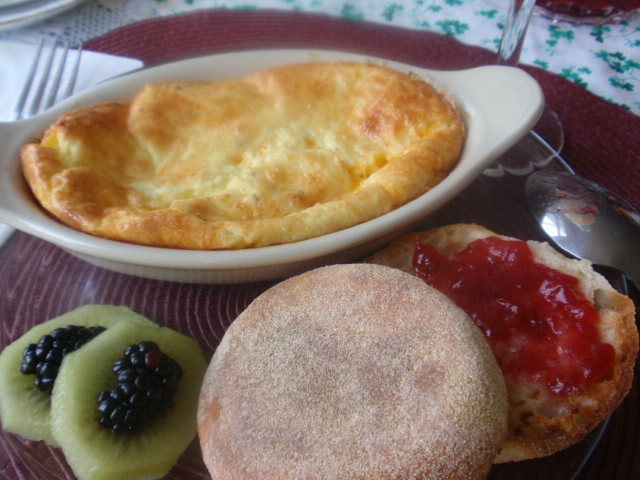 In fact, my stay did remind me of my Irish Bed and Breakfast experiences in Ireland many years ago. My hosts Judy and Mike Tann were exceptional ambassadors for Huron and the house. They are knowledgeable about the neighborhood, region and most importantly, where to eat. They approved of my intention to eat at Zinc but mentioned several other dining options that I should add to my list for the future. Two fellow guests use Captain Montague’s as their pre and post dinner lounge for dinner at nearby Chez Francois. Their tales of dinners past and present made me wish I had made a second reservation for the evening but good sense and a swat from my photographer du Jour ended that plan before I could dial the phone. For first time Bed and Breakfast guests (anywhere), the whole experience might seem a bit intimidating. You are staying in a person’s home, which in the Midwest, we typically limit to holidays with the in-laws, and even then, only with great reservation. The Tann’s easy-going demeanor and attention to detail allow guests to feel at ease and at home. The house is a showpiece but not so dainty as for one feeling the need to be afraid to walk about and enjoy the creature comforts of staying in a home instead of a drap and dreary, generic hotel. The Tann’s entered the world of Bed and Breakfast tending by a twist of fate. In 1994, they were looking for a condominium the area so they could enjoy their free time, instead fate decided to put them in the path of a Bed and Breakfast to consume them. 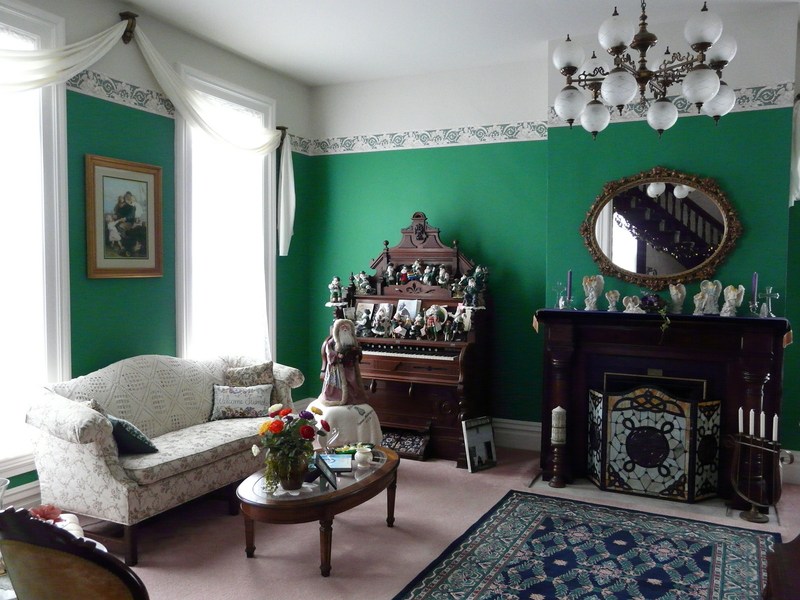 They moved on to restore one room at a time for the next decade. Fortunately for the guests, they stayed and have brought the Captain’s domicile back to its former glory and made the house a home. What else does the B&B have to offer? How about pillars and white picket fence in a residential neighborhood (known as The Old Plat) filled with historic homes just minutes from the Lakefront Park and the Huron Harbor Lighthouse. Ohio’s oldest continuous summer stock theater, The Huron Playhouse, is in production for five weeks beginning in July and just around the corner. Disclaimer: My lodgings were provided to me at no charge – they would be worth every penny paid and in fact, since this post is so delayed, I have sent a portion of my room fee to the owners to make up for my sloth. This entry was posted on August 14, 2012 at 12:15 PM	and is filed under CLEGourmand, Ohio, Road Trip, Sky Gourmand. 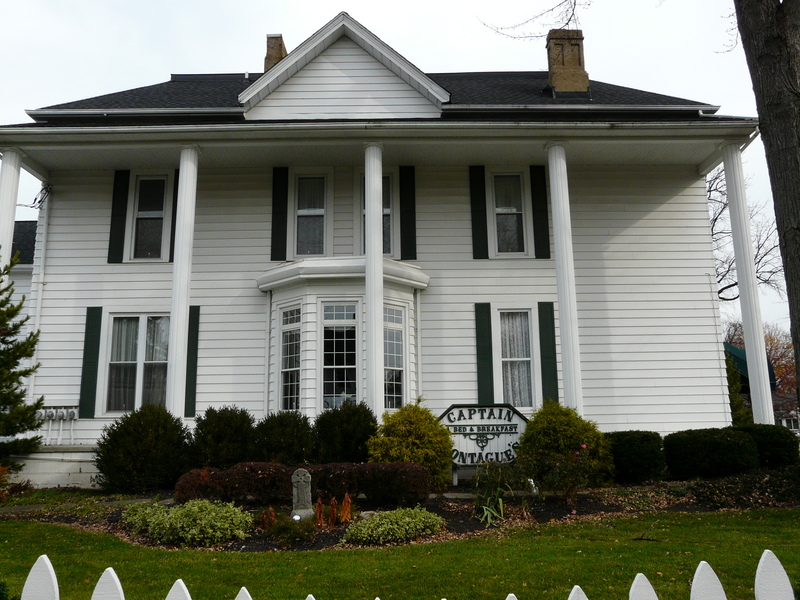 Tagged: Bed & Breakfast, Captain Montagues, Ohio's Food Coast. You can follow any responses to this entry through the RSS 2.0 feed. You can leave a response, or trackback from your own site.